UPDATED: In spite of the huge challenges of moving a language forward after near extinction, outcomes have been impressive. Editor’s note: This is the second installment of a three-part series on language and education in Hawaii. Read the first installment here. Many of the problems that we are facing in the world today will be visited upon our children as well. One of the best chances we have to ensure that they have the tools to deal with those issues is to give them the foundation of a great education. Hawaiian language, culture, and aina-based education does not only connect us with our ancestors; it allows us to connect with our futures as well. Re-learning connections to Hawaiian culture shows us a different way to connect to the land, a way that is becoming increasingly important. To change our world, we have to change our education, and this is something that those of us in the Hawaiian-language movement have been pushing for over the last few decades. In 1978, Hawaii voters approved a constitutional amendment establishing ‘Ōlelo Hawaiʻi as an official language of the state, making Hawaii the first state to provide such recognition to its indigenous language. Then, in 1983, a small but passionate group of Hawaiian language educators founded ʻAha Pūnana Leo with the mission to revitalize and re-establish a living Hawaiian language. Inspired by 19th-century Hawaiian language public schools and the New Zealand Māori language movement, it began opening pre-schools using Hawaiian as the sole language of instruction. In 1987, the Department of Education opened kindergarten programs at two DOE schools at the insistence of Pūnana Leo parents who wanted their preschool children to continue their education totally through Hawaiian. The modest DOE Kaiapuni Hawaiʻi pilot expanded to new sites as grassroots-supported Pūnana Leo preschools spread statewide. Thirty years later statewide there are 12 Pūnana Leo preschools and 17 DOE and six public charter school sites that combine various grades to provide the option of a full education through to high school graduation in Hawaiian. 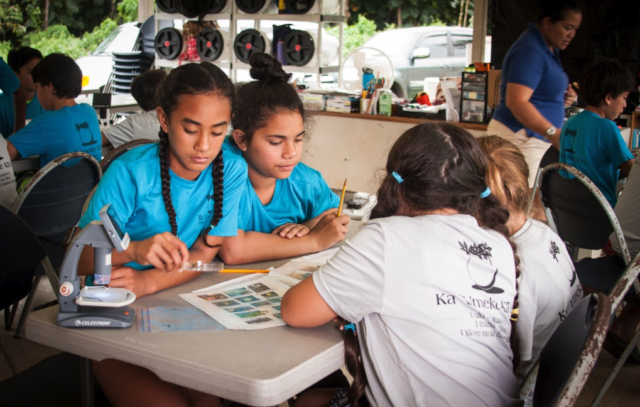 Fifth-graders from Ka ʻUmeke Kāʻeo Public Charter School use a dichotomous key to identify limu that they gathered from Haleolono Fishpond. In spite of the huge challenges of moving a language forward from near extinction, the outcomes of this movement have been quite impressive. Some of the highest rates of high school graduation and college attendance in the state have been reported from Kaiapuni sites. All students graduate bi-literate in both Hawaiian and English. Students have matriculated into prestigious out-of-state universities and a former Kaiapuni high school student is now a professor at Oxford. Other native communities nationally and globally look to Hawaii as a model for language revitalization. More and more parents have been seeking this sort of schooling for their children. The level of interest recently reached the point on Lanai where a parent has brought a lawsuit over the lack of Kaiapuni access on that island. The most important barrier to overcome to meet parental demand relates to teachers. Without an increased number of teachers highly proficient in Hawaiian and skilled in a variety of content areas, education through Hawaiian cannot grow. The number of Pūnana Leo preschools must also expand as they produce the core group of fluent speakers that jump-start the DOE program sites. Other challenges to education through Hawaiian emerge from a monolingual mindset in what is legally a bilingual state in a national context where Hawaiian is recognized as a Native American language with distinctive rights and policies. The most important barrier to overcome to meet parental demand relates to teachers. Federal assessment provisions inconsistent with Native American language policy are now being addressed by the Hawaii and U.S. Department of Education. There is also increased understanding among local educators of international research on the strengths of indigenous minority language medium education and its benefits. In spite of a high level of transfers to private schools and better resourced English public schools and in spite of barriers of various sorts not experienced in English schools, enrollments are growing in Kaiapuni schools faster than in English medium public schools. Five-year growth rates of Kaiapuni enrollments have been around 17 percent. Kapālama students at this year’s commemoration of the overthrow. Considering that teaching through Hawaiian was illegal from 1896 to 1986, the progress made has been quite amazing. Much of that progress has been due to an extraordinary level of commitment from families, teachers and staff. Support from the state, federal and private entities is also growing and hopefully will increase even more. The goal of “E Ola Ka ʻŌlelo Hawaiʻi – The Hawaiian Language Shall Live,” first expressed by the ʻAha Pūnana Leo in 1983, is coming to fruition. That year the organization took a count of children under 18 statewide who spoke Hawaiian fluently, finding less than 50. Today that number has grown a hundredfold with all also proficient in English. Yet, 5,000 highly proficient Hawaiian speakers under the age of 18 is still less than 2 percent of the public and private school enrollments of our state. Hopefully we can all support this unique form of schooling to grow even more such children for Hawaii. The more students we grow, Hawaiians and non-Hawaiians alike, the more minds we have who will know that things have to change, who will push for a different way of living on this aina and in the world. Hawaiian education is a powerful and proven way forward, so help us forge our way ahead by joining in and supporting our efforts. This series was produced in concert with Kanaeokana, a network of over 80 organizations and individuals whose mission is to collaboratively develop and strengthen a Native Hawaiian education system — built on a foundation of strong ʻōlelo Hawai‘i (Hawaiian Language) and ʻike Hawai‘i (Hawaiian Knowledge and practices). Kanaeokanaʻs Advocacy committee surveyed 2018 Hawaii Legislature and Office of Hawaiian Affairs candidates about their position on education issue. Learn more about where this year’s candidates stand on education at www.kanaeokana.net/vote. 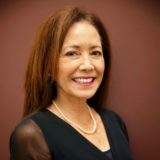 Monica Morris is a public policy advocate with the Office of Hawaiian Affairs. William H. “Pila” Wilson is a professor of Hawaiian language, Hawaiian studies and linguistics at Ka Haka ‘Ula O Keʻelikōlani College of Hawaiian Language at the University of Hawaii-Hilo.